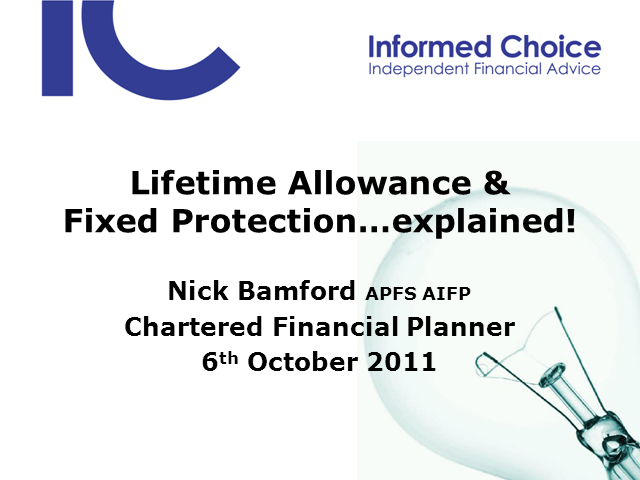 Informed Choice chartered financial planner Nick Bamford looks at the changes to the pension Lifetime Allowance being introduced on 6th April 2012 and how Fixed Protection can be used to avoid a large tax charge. Informed Choice chartered financial planner Nick Bamford discusses the subject of investment risk and asks whether investors are taking too much risk with their portfolios. In this webcast from Informed Choice financial planner and care fees specialist Catriona Lumiste, we will explain the ten things you need to know about the cost of care. With more of us needing long-term care in our older age, this important webcast will explain the cost of care, how it can be funded and the other considerations for care fees planning. Informed Choice chartered financial planner Andrew Neligan describes the key personal finance measures contained within the Budget 2012 and explains what steps you need to take now. Informed Choice financial planner Catriona Lumiste presents this webcast explaining the ten things all women need to know about their financial planning and divorce. Informed Choice chartered financial planner Nick Bamford describes seven important things you need to know about your retirement income options. Informed Choice chartered financial planner and CFP professional Andrew Neligan talks about the five most common mistakes made by investors this year and the steps you can take to prevent them from happening again in 2012. Informed Choice chartered financial planner and CFP professional Andrew Neligan describes the unique Financial Planning challenges faced by people in retirement providing financial support to adult children and elderly parents. Informed Choice chartered financial planner Nick Bamford takes a closer look at the investment obligations of trustees and the steps they can take to ensure these are satisfied. Informed Choice chartered financial planner and CFP professional Andrew Neligan explains the ten questions you must ask before working with an IFA or Financial Planner, and the answers to these questions you should be listening for. Informed Choice chartered financial planner Andrew Neligan will be sharing with you the ten things you need to know about your Financial Planning, to enable you to build, manage and protect your wealth. Informed Choice chartered financial planner Nick Bamford provides a practical summary of the Budget 2011 announcements and considers their implications for your personal financial planning. Informed Choice chartered financial planner Nick Bamford gives an overview of the FSA Retail Distribution Review (RDR) and what it will mean for your financial adviser in terms of qualifications, fees and the services they provide. Informed Choice chartered financial planner and CFP professional Angela Murfitt explains the issues associated with divorce and financial planning, including the various pension options and ensuring you have sufficient protection in place for maintenance payments. Informed Choice Chartered Financial Planner and CFP professional Andrew Neligan shares his top Financial Planning tips for Legal Professionals including Solicitors, Barristers and Judges. Informed Choice chartered financial planner Nick Bamford describes the highlights of the emergency Budget and what it means for your personal financial planning. Informative personal financial planning and investment webcasts from IFA of the Year and Gold Standard Award winning firm of Chartered Financial Planners Informed Choice.